On September 13, 1952, singer Randy Jones of the disco group Village People was born in Raleigh. Jones grew up in Wake County, graduating from Enloe High School in 1970. After attending the North Carolina School of the Arts and UNC, he began to dance and act professionally in New York City. The concept of the Village People group was the brainchild of record producer Jacques Morali. Jones was cast as the original cowboy in 1977, and remained with the act for three years. 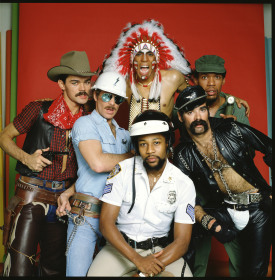 The idea of a concept group was not a new one, but the Village People were imbued with such energy, irony and campy enthusiasm that they were wildly successful. In fact, some form of the group has been performing since the Village People scored their U.S. first hit with “Macho Man” in 1978. The group racked up a number of big hits in the late 1970s and early 1980s with “Y.M.C.A.,” “In the Navy,” “Go West” and “Can’t Stop the Music” among others. That period of great creativity was the group’s heyday. Jones, appropriately, lives in Greenwich Village. He continues to perform and act.